Flush mount, twin outlet modular jack and plate. Fits all standard modular phones. Permits connection of two phone or phone / answering machine combination. Installs in standard electrical box, to replace existing flush mount jack or add new jack. 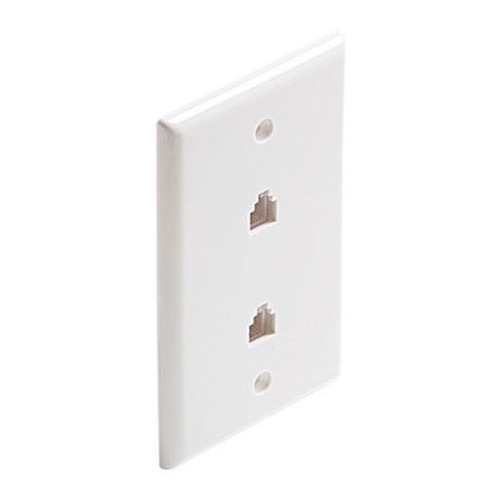 Remove existing wall plate and jack. Remove 1-1/2" of insulation from colored wire leads. To tie in answering machine or additional phone on same line, transfer wire leads by color to top jack terminals. Attach wire leads from line cord by color to top jack terminals. To connect two separate phone lines, connect each incoming line cord to a separate terminal block. Attach wire leads by color to terminal screws.